Difference between revisions of "MDT-UML2Tools FAQ"
Use 'Import>Team>Team Project Set' action in order to import projects into your workspace. Other useful information on generating UML2Tools diagram is in [http://wiki.eclipse.org/MDT-UML2Tools_How_To_Regenerage_Diagrams How To Regenerage Diagrams] wiki. Different icons for stereotyped element can be used, for example, when you set the stereotype of a class to plane and you want the diagram to use your defined shape of a plane when displaying the model. UML2 Tools developers hope to implement the functionality soon. You can track [https://bugs.eclipse.org/bugs/show_bug.cgi?id=246358 bug 246358]for the changes. 1.2 Which UML diagrams are supported by UML2Tools? 1.3 How can I start with UML2Tools? 1.4 Which GMF version is used to generate UML2Tools source code? 1.5 Where can I find GMF-sources? 1.6 What metamodel do UML2Tools use? 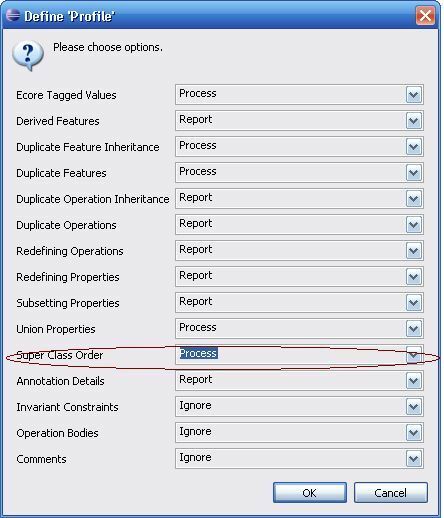 1.7 What are *.uml and *.umlclass_diagram files for? 1.8 Can I restore diagram from semantic model (*.uml file)? 2.1 I want to customize the UML2Tools class diagram. How can I regenerate the diagrams? 3.1 Is it possible to add constraints to the profile (perhaps OCL)? 3.2 Can I have multiple generalizations for stereotypes? 3.3 Is the source code for umlprofile_diagram in the CVS Repository? 3.4 Has there been any work on profiles to support different Icons? UML2 Tools is a set of GMF-based editors for viewing and editing UML models. Which UML diagrams are supported by UML2Tools? 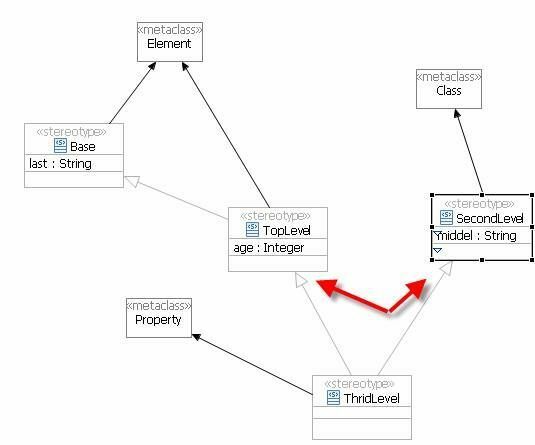 Class, Profile Definition, Component, Activity, State Machine, Composite Structures, Deployment and Use Case diagram editors are available in UML2Tools. How can I start with UML2Tools? First, install UML2Tools and its dependencies to your Eclipse platform. You can also install UML2 Tools via Update Manager. To check that UML2Tools feature is installed correctly go to Help/About Eclipse SDK, in the appeared dialog press 'Feature Details' button, feature with id 'org.eclipse.uml2.diagram' should present at the list. If so then New Diagram wizards are available in the 'New/Other/UML 2.1 Diagrams' wizard group. Then you may create diagram by your choice. Which GMF version is used to generate UML2Tools source code? UML2Tools diagrams use 'fresh' GMF. Source code is regenerated with up-to-date GMF on every significant change in GMF and on milestone. It is so because GMF provides more and more features with every iteration. However, some amount of custom code exists in this project. This code is put into 'custom-src' folder or marked with '@generated-not' tag. Note that we use 'Generate UML2Tools Diagrams' action in the context menu of *.gmfgen files to generate code. This action is available if you have GMF-sources checked out in your development workspace. Where can I find GMF-sources? cvs -d pserver:dev.eclipse.org:/cvsroot/modeling co org.eclipse.mdt/org.eclipse.uml2tools/plugins/org.eclipse.uml2.diagram.def . What metamodel do UML2Tools use? UML2Tools use an EMF-based implementation of the UML™ 2.x metamodel for the Eclipse platform from UML2 project. What are *.uml and *.umlclass_diagram files for? UML2Tools diagram is presented by two files in the file system - domain model file (*.uml) and diagram file (*.umlclass_diagram, *.umlstatemachine_diagram). This is a standard for GMF-generated diagram editors. More information on GMF page. Can I restore diagram from semantic model (*.uml file)? Yes, it's easy. To 'visualize' diagram from *.uml file use 'Initialize Class Diagram' action from the context menu of the file. There are also actions to initialize Component, Activity or State Machine diagram, choose the one you need. Appropriate diagram file (*.umlclass, *.umlcomp etc) will be created and then open. This feature is provided by GMF. I want to customize the UML2Tools class diagram. How can I regenerate the diagrams? There is a special "MDT-UML2Tools How To Regenerage Diagrams" page in with step by step instruction. Is it possible to add constraints to the profile (perhaps OCL)? Can I have multiple generalizations for stereotypes? After that Profile will be applied well. Is the source code for umlprofile_diagram in the CVS Repository? This PSF file consists of plugin for profile diagram editor(org.eclipse.uml2.diagram.profile) and its dependencies from UML2Tools. Use 'Import>Team>Team Project Set' action in order to import projects into your workspace. Other useful information on generating UML2Tools diagram is in How To Regenerage Diagrams wiki. Has there been any work on profiles to support different Icons? Different icons for stereotyped element can be used, for example, when you set the stereotype of a class to plane and you want the diagram to use your defined shape of a plane when displaying the model. UML2 Tools developers hope to implement the functionality soon. You can track bug 246358for the changes.